Despite Chinese and western aid funded construction boom in Addis Ababa, 80% of the city residents live in slums, according to the United Nations. The minority regime in Ethiopia and its handlers have tried to hoodwink the Ethiopian people and the international community by misrepresenting facts about the country and its economy. 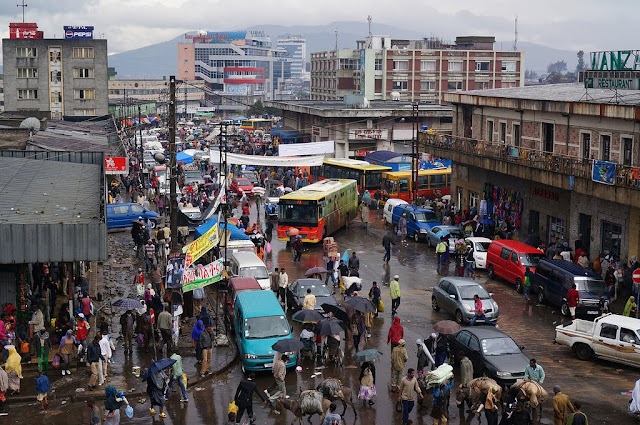 With the western media in tow, Ethiopia’s leaders reported “double digit” economic growth in Ethiopia and labeled it “one of Africa’s top performing economies”. The statements presented a very rosy picture of Ethiopia and hid the income inequalities, adjunct poverty and dismal standard of living that persist. Today, the regime and its partners are forced to admit and present the true state of the Ethiopian economy and its effects on the majority of the population, of which 15 million are now in need of food aid. Ethiopia touted as the “powerhouse in the Horn” is once again begging the international community to feed its people. 8Miles, the private equity firm Geldof chairs, owns Blue Nile, a company which acquired the 70-year old winery based in Addis Abeba and vineyard near the town of Ziway from the Ethiopian Privatization & Public Enterprises Supervising Agency (PPESA). But just a few months later, the headlines would read differently. But the regime went on an extensive propaganda campaign to deny that there was “famine”. Addis based diplomats and journalists remained mum as the regime’s cadres hid the impending humanitarian disaster unfolding right in front of their eyes. When the BBC reported about the famine, the minority regime was not happy and it sent out its deputies to ridicule its reports. In addition, the minority regime put out a Press Release[ii] on 10 November 2015 decrying news reports about famine in Ethiopia. Gayle Smith, longtime friend of the TPLF regime and now Administrator for the U.S. Agency for International Development (USAID) echoed Ban Ki Moon when she made this announcement on 31 January 2016. The food crisis in the country was downplayed and the reckless regime chose instead to deal in semantics- renaming “famine and starvation” as “food insecurity”. NGOs were warned not to use the words “famine, starvation or death” in their food appeals. The NGOs were not to state that “children are dying on a daily basis,” or refer to “widespread famine” or say that “the policies of the government in Ethiopia are partially to blame.” They were also not allowed to “compare the current crisis to the famine of the eighties.” They were not to place the blame on the government or its development policies that have uprooted Ethiopians from their lands. Instead, the latest drought in Ethiopia was to be described as “food insecurity caused by a drought related to El Nino.” The regime was desperate to maintain the narrative of Ethiopia’s great economic renaissance, and the “double digit” annual growth. It was more interested in saving face, than facing the fact that millions of its own people continue to be “fed by donated sacks of grain”. It did not take long for the bottom to drop. Not getting the donor response it desired, the regime is now resorting to threats. Finally, researchers have long argued that poverty was the ultimate cause of famine-and that climate acts simply as a catalyst. Blaming the famine in Ethiopia on El Nino likens it to a natural disaster-it is misleading and irresponsible.